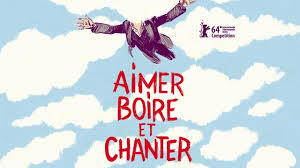 For fans of veteran director Alain Resnais, Aimer, Boire et Chanter (Life of Riley), his final film before he died this March, is a fitting end to a career which spanned over six decades and produced such masterpieces as Hiroshima Mon Amour, Last Year in Marienbad and On Connait la Chanson (Same Old Song). 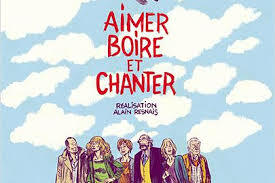 For those less familiar with the work of this French auteur, the film is slow and dated with a mannered and stilted dialogue devoid of wit and originality. his was Resnais’ third adaptation of an Ayckbourne play and features the same focus on the English middle-classes and marital breakdown. Three couples from a Yorkshire village in the north of England learn their good friend George is dying of cancer and has only months to live. Kathyrn (Sabine Azéma) is married to dull Dr Colin (Hippolyte Girardot), Tamara (Caroline Silhol) lives a comfortable life with the rich, philandering Jack (Michel Vuillermoz), while mousey Monica (Sandrine Kiberlaine) has left George to set up home in the middle of nowhere with Simeon (André Dussolier). The news of George’s imminent demise throws these relationships into chaos revealing frustrations and misery previously masked by habit and routine and that, oh so British, stiff upper lip. Using French actors in a quintessentially English play certainly allowed Resnais to indulge in his more playful side. The dialogue is French, but the setting and props are English lending the film an absurd, unreal feel. Visually Resnais has kept to the play’s theatrical roots by shooting on sound stages with artificial decor and painted backdrops while the characters enter and exit through long curtains at the back of the set. And in a nod to his love of Bande Dessiné, there is a drawing at the start of each scene by the French graphic artist Blutch who also designed the posters for Resnais last three films.